We recently bought the latest CD release by one of our favourite Southern Gospel groups, Legacy Five (pictured). After our 1st "listen" my son Matthew and I agreed upon our favourite song, Statement of Faith. Here's a YouTube rendition of this incredibly powerful song. The graphics aren't the best and the sound towards the end is not good. Still, your will be blessed by the affirmation of "those things which we believe." The groups that joined in on this song were Greater Vision, the Hoppers, Legacy Five & the Booth Brothers. Click here and be blessed. This is the song that features not only Legacy Five but The Hoppers, Greater Vision and The Booth Brothers. It is a very powerful song that has already shown at NQC that the people will love it. I love the addition of the reading at the end by Gerald Wolfe. The Legacy Five guys that were featured on this song, were Scott Howard and Scott Fowler. But the standout moment vocally comes from Jacob Kitson the tenor for Greater Vision. He really sings his line with power. I truly hope these groups will strive to live by the message in this song. And one that I hope people listening to will take on in their own lives. dear david..i think it was very good actually. i really miss going to concerts. what hurts me about this video is to see the many empty seats. usually every seat used to be filled, this is a shame! we used to to to hamilton twice a year to mohawk colleger[the college that nicky took his piano and ended up with the carolina boys and then the kingsmen...i don't know where he is now] but now there is no concerts there and also once a year we went to tonawanda to the theatre where the kingsmen and gold city and a different group sang each year. i am just so thankful that at least we can see "live" singing like the legacy five and others on you tube. god bless you david and may you be a blessing to the lords people. That was great, David. 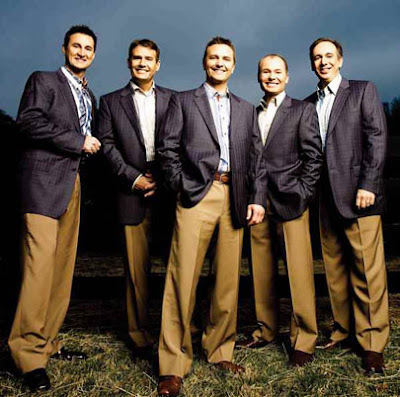 I loved seeing them at the NQC. I have heard Steve Brock sing that song. Thanks for introducing me to Legacy Five. I am from the South and don't even know some of these groups! As an ASCAP publisher, I need to be contacting some of them about my music. There's a new video posted on youtube.com of this song. The camera work is a little better than the previous one.